I currently keep track of kitten weights using pen and paper. It allows me to see whether a kitten is gaining weight on a constant basis. However, at the recent NBA Cat Club seminar, it came to light that a more accurate way of tracking weights could be critical in monitoring a kitten’s progress. The speaker was Dr Susan Little, and she was discussing flat-chested kittens, a physical problem in which the kitten’s chest is flattened. This restricts space for the lungs, and as the kitten grows causes breathing problems and eventually heart problems. Flat-chestedness varies in its severity and may sometimes be overlooked. However, flat-chested kittens tend to lose ground from about week 2 onwards. 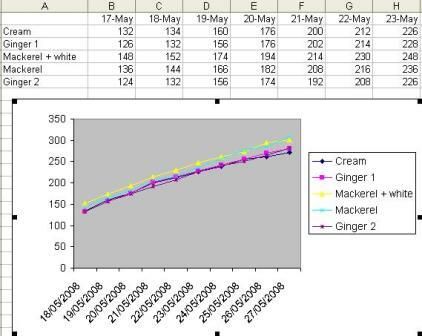 Dr Little cited the example of a breeder who recorded a litter’s weights using an Excel spreadsheet together with a simple line graph charting each kitten’s weight. It was instantly obvious that while all the kittens gained weight, one kitten started falling behind from week 2. This kind of comparative discrepancy can be hard to determine on paper because kittens don’t always gain at a constant weight, and it looks like all the kittens are getting heavier.